SAM RUSSELL is a guitar virtuoso. 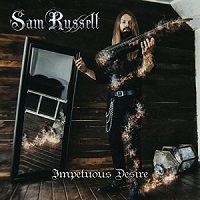 “Impetuous Desire” is a beautiful, well produced album which shows all talent. The first song, “The Disciples Hand”, sets the tone of the album wonderfully. It is a hard-driving loud guitar song that makes the heart skip a beat. Looking for a good guitar driven song? Then look no further. The guitar is the star of this album. “Waves of Tomorrow” is a beautifully composed Power Metal song that has wonderful guitars as well as drums. This will be played quite a bit by anyone who enjoys a fast-paced power ballad. “Longing” is the fourth track from the album. This song features Jacqueline Phillips who accompanies fantastically. The softness of this song is what is so captivating. The strings and the guitar play off each other well. It is a nicely composed piece but is only one of the highlights of this entire album. The next track is “Leigh Woods” (feat. Doro Pesch). The song begins slow and is a lovely power ballad. It can tear at the strings of one’s heart. This is beautiful vocal pairing with Sam Russell and Doro Pesch. This writer’s favorite on this album. “Tonight” is a heavy guitar driven song with a great sound. The solo in this is wonderful. “Fire, Desire” (feat. RYAN MUELLER) begins with another lovely guitar beginning that is more than just beautiful. It then goes into harshness that is pure Metal. A unique change in the direction of the album. “Riffstrumental” ends the album. It is guitar playing at Russell’s best. It has a different sound to it. It begins slow and then picks up into a heavier guitar instrumental. This is a well composed and produced album throughout. Any guitar enthusiasts will be thrilled to add this to their collection.